Pacific Paradise finally towed away, sunk at sea. The Pacific Paradise sank to its watery grave Thursday afternoon, ending a nearly two-month saga to get the grounded fishing vessel off the reef at Kaimana Beach. Star-Advertiser. 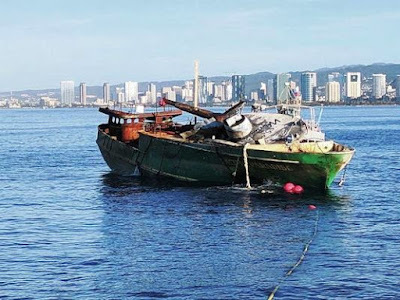 Salvage Team Tows Wrecked Fishing Boat Off Waikiki Reef. Aided by a high tide, a tugboat pulls the Pacific Paradise out to sea where it will be sunk two months after it ran aground. Associated Press. 2 months after it grounded off Waikiki, big fishing boat finally removed. Hawaii News Now. Remaining survivors determined that Pearl Harbor not be forgotten. The dwindling sentinels of Pearl Harbor faithfully returned on the 76th anniversary of the surprise Japanese attack Thursday to reminisce and honor fellow warriors from the greatest generation still living and gone. Star-Advertiser. 100-year-old veteran inspires bill for Pacific war memorial. A bipartisan bill called the “Admiral Lloyd R. ‘Joe’ Vasey Pacific War Commemorative Display Establishment Act” unanimously passed the U.S. House on the 76th anniversary of the Japanese bombing of Pearl Harbor. Star-Advertiser. Trump travel ban to be heard by federal appeals court. President Donald Trump’s updated travel ban is headed back to a federal appeals court in Virginia. Associated Press. VIDEO: Hawaii vs. Donald Trump At Appeals Court. A three-judge panel of the Ninth Circuit Court of Appeals heard arguments Wednesday on the merits of the third version of the President’s ban on travel from several Muslim-majority nations. Big Island Video News. Hawaii Urges DHHS Not to Roll Back Contraception Coverage Mandate. Attorney General Doug Chin announced that Hawaii has joined a letter authored by New York Attorney General Eric Schneiderman pressing Eric Hargan, Acting Secretary of the US Department of Health and Human Services, not to roll back the contraception coverage mandate that is part of the Affordable Care Act. Maui Now. Feds: Many Public Housing Units For The Disabled Aren’t Really Accessible. The Hawaii Public Housing Authority is appealing the preliminary findings of a federal investigation. Civil Beat. Island Air bankruptcy is 'a catastrophe,' judge says. A federal bankruptcy judge lashed out at Island Air in court Thursday for the treatment of its employees as the liquidation of the state’s second-largest airline appeared to be headed for an early termination due to lack of funds to administer the case. Star-Advertiser. Trade "Clusters" and Hawaii's Economy. U-H Economic Professor, Carl Bonham, says the Hospitality and Tourism cluster in Hawaii is five times more concentrated based on employment than in other states. Hawaii Public Radio. Hawaii employees of GE's power division not affected by layoffs, source says. Hawaii employees of General Electric Co.'s power division are currently not affected by the company's decision to cut its global workforce by 12,000 positions. Pacific Business News. Hawaii mumps cases reach 685; health officials broaden recommendation. The Hawaii Department of Health is asking all residents to get an “outbreak vaccination” against the ongoing flareup of mumps cases statewide. Tribune-Herald. City Council approves expansion of State Hospital. Long-range expansion plans for the Hawaii State Hospital have been approved by the Honolulu City Council after the facility’s staff gave assurances that improvements would include a perimeter fence and other public safety measures prompted by the recent escape of a patient deemed to be dangerous. Star-Advertiser. City to convert empty building into 30 affordable apartments. The city has purchased another three-story building in town — on Young Street, Ewa of McCully Street — which will add another 30 studio apartments for people who earn just over $36,000 per year. Star-Advertiser. One Ala Moana Condo Development Approved And Another In The Pipeline. Developer Jay Fang wins approval for his 26-story tower despite some rocky moments at Wednesday’s City Council meeting. Civil Beat. Former Kawamoto lot on Kahala Avenue sells for $13M. A 1-acre beachfront lot on Kahala Avenue that once belonged to Japanese billionaire Genshiro Kawamoto was sold this week for $13 million to a Chinese multinational company that is planning to build a new house on the site. Pacific Business News. Fire department releases 911 calls made during deadly Marco Polo building fire. KHON2. No threats against Honolulu Marathon, but authorities aren't taking any chances. On Sunday, 28,000 runners from all over the world will participate in the 45th annual Honolulu Marathon. Hawaii News Now. Queen Kaahumanu Highway project costs rise again. It’s going to cost another $16.3 million to widen Queen Kaahumanu Highway from Kealakehe Parkway to Keahole Airport Road, compared to numbers released earlier this year, putting the project more than $30 million over initial estimates from its groundbreaking two years ago. West Hawaii Today. Miss Hawaii 2015 to run for state House. Former Miss Hawaii Jeanne Kapela announced Thursday she’s throwing her crown in the ring for what’s shaping up as a competitive race for the open District 5 House seat. West Hawaii Today. Paradise Helicopters expands fleet with first twin-engine helicopter. Paradise Helicopters has added a twin-engine Bell 430, becoming the first Hawaii tour company to operate a twin-engine helicopter. Pacific Business News. Ohio investor to buy state’s second-largest dairy. An Ohio entrepreneur and financial planning company executive is advancing an initiative to acquire Hawaii’s second-largest dairy as part of a plan to more than double the production of local milk in the state. Star-Advertiser. Three injured after state vehicle strikes school bus. Two children and a state employee were injured Wednesday morning after a state pickup truck struck a school bus in Mountain View. Tribune-Herald. Keauhou Beach Hotel demolition progresses. The Keauhou Beach Hotel is literally a shell of its former self — the soft demolition completed and the inside of the structure gutted. West Hawaii Today. Firefighter disciplined after reportedly ‘reeking of alcohol’ while on duty. A Hawaii island firefighter is being disciplined for having alcohol in his system while on duty. KHON2. Thieves target Big Island humane society — twice. The Hawaii Island Humane Society is looking for crooks who stole animals at a shelter. Hawaii News Now. Atherton’s Waikapu project finishes evidentiary phase. LUC chairman orders drafting of panel’s proposed final action. Maui News. LUC members hear testimony backing ‘agrihood’ project. Land Use Commission members heard several hours of testimony Wednesday as part of hearings on proposed state district boundary amendments for the nearly 500-acre Waikapu Country Town project. Maui News. Maui Cannabis Conference hosts its inaugural Maui Cannabis Conference on Saturday and Sunday, Jan. 6-7, 2018 at the Hyatt Regency Maui Resort & Spa in Kaanapali. Maui Now. Mayor candidates state cases. Derek Kawakami, Lenny Rapozo and Mel Rapozo mingled with attendees at the Christmas party setting before taking the stage Thursday at in the Kauai Marriott Resort and Beach Club. Garden Island.